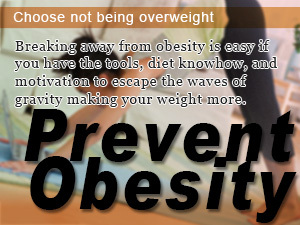 Prevent obesity and keep from being overweight. 10 things you can do to make steady progress in your diet shaving of pounds of fat making it worth it. In order to prevent obesity and being overweight from tearing up your dreams of being fit there is always something you can do before it's too later. Here are 10 things you can do to get rid obesity and fat to restore your self-esteem and life energy. What can I do to stop choosing to be overweight? Even if the feeling to want to get rid of obesity matches; no diet went well... so is that there are many saying people? 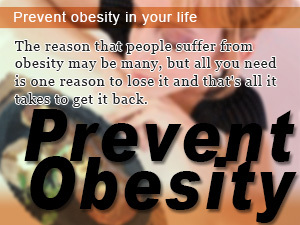 Each person is the cause of obesity. But so is overeating and lack of exercise, obesity also cause disruption of lifestyle. Do not you think than diet that becomes popular, no matter how much better to remove the cause of their obesity is very effective in obesity? We will continue to introduce appropriate to the cause of obesity, and that of 10 which can be due to obesity. In this walk in Slism, we will discuss ten things you can do to prevent obesity to stop being overweight. You only eat to meals per day! No wonder why you are... fat. For most people what skipping a meal usually means is uncontrollable eating followed by guild that doesn't help you get motivated to take your next step? Which will be overeaten in spite of themselves if alcohol is drunk have many people who have overeaten supper. It may become obese because a calorie per day is the same, but there are too many calories for dinner. Since there your body doesn't burn off that much calories at night, it becomes easy for the calories you take in during your evening meal to be stored away unspent after sleeping. Due to increased absorption of nutrients, the good you put in your body during the evening is likely to be stored away as fat. Even though you're not going to eat so much, wondering why ...... fat amount you are eating even if not many, people who might have to eat high calorie. In a lot of lean meat and fried foods, I would consume more calories even in small amounts. Check the calories of food; we try to keep away from high-calorie foods. >> Be conscious of the calories you put in your body cutting down on higher calorie option as much as possible. And eat only what you like, I would collapse nutritional balance. Would reduce the efficiency of the diet, you can eat only certain things, or do not eat certain foods, they will cause the fat. We need nutrients can promote the metabolism, but also for or to burn fat; because they not only have an adverse effect on diet, health and beauty as well, always try to eat a balanced nutrition. >> Plan out your meals keeping in mind the nutritional balance making sure you cover all the bases of vitamins and minerals your body needs to keep healthy. It is good if the proper amount of alcohol is not good for health also diet is drinking too much. You do not need to force abstinence, it is important that I keep in an appropriate amount. In addition, it is necessary to reduce a calorie to take in by food for one of the calorie that I took in with alcohol. >> Drink responsibly always knowing how much you drink. If you are someone that drinks a lot don't hoard. Plan out days where you can take a break from drinking. The people are also obese family; tend to give up obesity as "blame" Genetic ago. However, very few cases he or becoming obese by genetic constitution. It is the main causes that a family and the person himself/herself are leading in fact the eating habits which are growing fat easily, and a lifestyle. It is not a constitution which is growing fat, but since it is the eating habits and the lifestyle which is growing fat easily, it is improvable. It is important not to give up. Since lack of exercise reduces the amount of muscles and the consumption calorie by activity not only decreases, but it lowers basal metabolism, it will make the constitution in which are easy to grow fat and it is hard to become thin. In addition, the higher the degree of obesity, increases the burden on the joints, it becomes prone to lack of exercise. Person of a person with a high numerical value of a corpulence degree (BMI), and lack of exercise ...as follows. If it exercises suddenly, since a burden will be easily placed on joints or internal organs, it starts with light movement. Rather than movement performed ashore, since movement performed underwater can ease the burden on a joint, underwater movement is recommended. How is stress canceled if stress accumulates?? If there are also many people who eat and cancel stress, it is a total loss, if the dietary restriction for a diet will be stress and will lead to gross overeating. A chronic stress will promote appetite. Let's go on a drastic diet which is not and relieve stress briskly. How do I measure stress? Irregular life prone irregular eating habits, leads to overeating and supper and a biological clock may come and it becomes easy to cause a bad condition to autonomic nerves and hormone balance by things. Moreover, if it becomes lack of sleep, it will be the cause of stress, and secretion of the hormone which gives a feeling of fullness will be reduced, and appetite will be promoted. People have become nocturnal life, such as incorporating exercise, try to improve their lifestyle. There is a degree of obesity as well, some even severe (four times) from those with mild (1 degree). Would be also important to know which of their degree of obesity are in your step. The degree of overweight is understood with a corpulence degree (BMI). Since it is computable only in height and weight, let's check by all means. The reason that people suffer from obesity may be many, but all you need is one reason to lose it and that's all it takes to get it back. Breaking away from obesity is easy if you have the tools, diet knowhow, and motivation to escape the waves of gravity making your weight more. 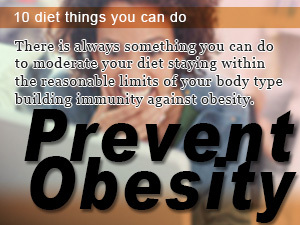 There is always something you can do to moderate your diet staying within the reasonable limits of your body type building immunity against obesity.